So you don’t have a boat, you haven’t landed any barra and you’re getting desperate. Time to up the anti and start fishing at night. Barramundi become more active at night, increasing your chances of landing a big one. Unfortunately crocodiles are also more active at night. In fact crocodiles love hunting at night. They seemingly appear out of nowhere, wandering around looking for a tasty night time snack. During the day you may notice only a few crocodiles, but at night they come out in great numbers. It’s risky fishing at night around crocodile infested waters. A good proportion of the time you’ll die from fatal crocodile attacks. This article addresses how to mitigate the risk and keep you safe. There is no way to eliminate the risk, so keep that in mind when deciding whether to go fishing around crocodiles, at night or during the day. This is your main weapon. Anyone writing an article who is concerned about potential litigation is going to recommend never fishing at night. It’s the best way to minimize the risk and ensure your safety. Have a look at my main article on land based fishing with crocodiles. Follow these guidelines, but lean towards being even more cautious. Stand further back from the water’s edge than you otherwise would. Drink less beers than you otherwise would. The eyes of crocodiles are easily visible at night when they are above the water when a bright light is shone upon them. 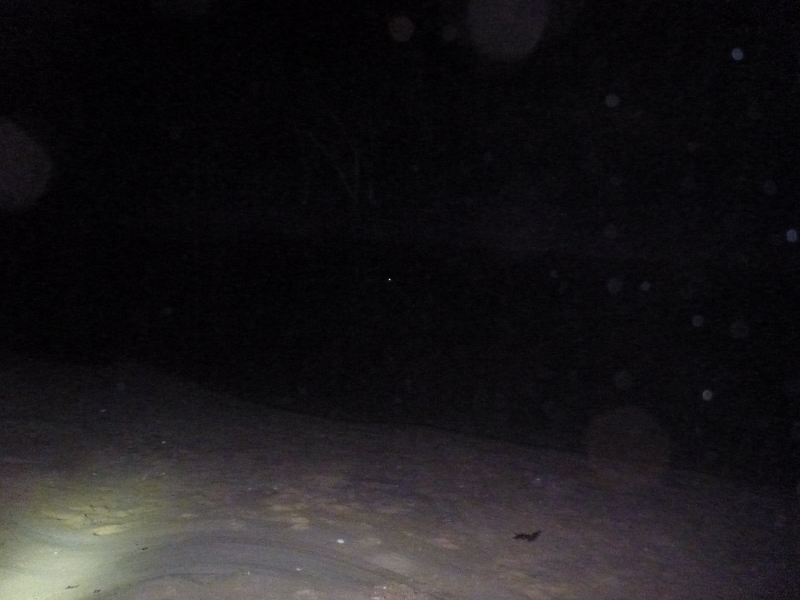 This is how crocodile surveys are conducted – using spotlights from a boat at night. You need a torch of at least a few hundred lumens. Modern high powered LED torches are a good solution. They are bright and, due to their efficiency, last a long time. The crocodile’s eye will reflect light in the direction of the light’s origin. So you can’t rely on a fixed light from your vehicle or any other fixed position. The light needs to come from your direction if you want to see the crocodile’s eyes, so you need a hand held torch or a head torch. The bright dot in center frame is the eye of a crocodile reflecting light from a bright torch. Photo taken at Boat Creek, Dundee Beach. Several times a minute you should be using your torch to scan for crocodiles. Ensure there are no crocodiles getting too close to you. Count the number of crocodiles in your view and try to keep track of their position. Avoid fishing alone at night near crocodile infested waters. Have friends who are also scanning the water for crocodiles whilst they fish. This improves the chances of detecting an approaching crocodile early. Even better, have a mate who isn’t fishing who is the designated crocodile spotter. He can continuously track all the crocodiles using a bright torch. Crocodiles have a habit of leaving the water and meandering at night. They’re probably not actively pursuing you, but if they get close enough they’ll give you a go. Often a crocodile will lazily leave the water at night. It will emerge slowly and silently and lumber around. You won’t hear it, and because it’s dark, you won’t see it. You need to be looking to the sides and behind to make sure a wondering croc doesn’t come within striking distance. 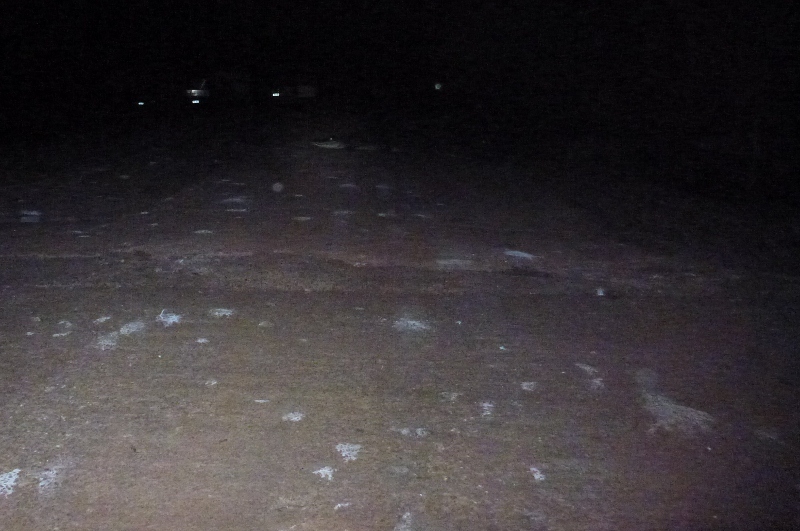 A 3 meter crocodile crossing the barrage at night at Shady Camp, Northern Territory, stranding us on the far side of the Mary river. If you notice a crocodile approaching you, it may be prudent to retreat. At some stage the croc will submerge completely, after which you’ll lose its position and be at the mercy of a potential strike. Unrelated to crocodiles, but don’t forget, fishing at night in tropical areas exposes you to the risk of mosquito borne illness. Take appropriate precautions.